Earlier this spring, the Planting Asparagus – Part 1 post discussed some basics of getting the asparagus in the ground. Unlike many other garden plants, asparagus requires quite a bit of effort to get going. 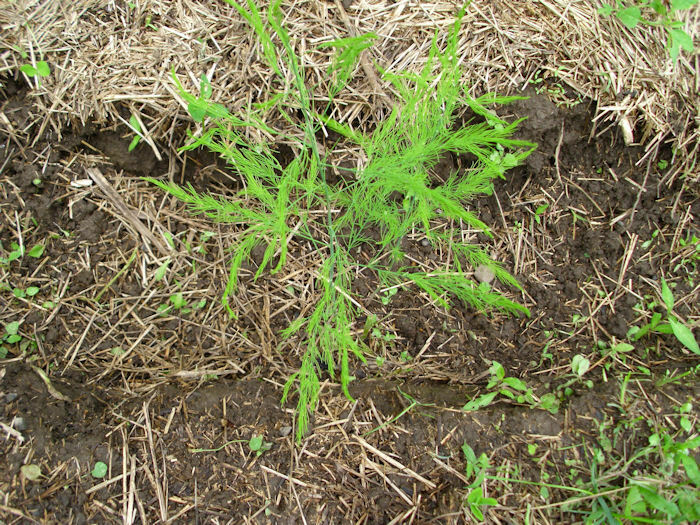 However, once planted, an asparagus bed will flourish for many years without much in the way of maintenance, so the up front effort is worth it. That’s right, it looks sort of like a fern on a stem. By now you should have a number of these fern-like growths in the trench. When they get this tall, you need to start adding dirt to the trench. Don’t bury any of the branches coming off the main stem. Add just enough loose dirt (don’t pack it down) to bring the trench up to the next level. Burying part of the stem will encourage the asparagus to grow taller. Now you’ve got some asparagus to tend, but it’s still not done yet for this summer. We’ll visit this topic again. In the meantime, let me know if you have any questions at John@JohnMuellerBooks.com.